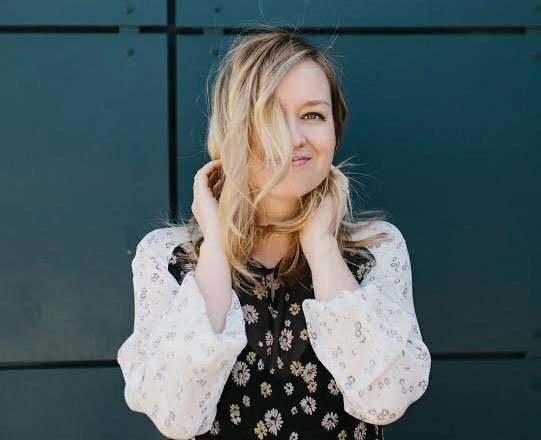 We are continuing our two-for-one series but this time, I’m switching up the protein. If you’re just tuning in, what I mean when I say “two-for-one” you get to take one main ingredient and spread it across two meals, saving some time and energy. Sometimes I freeze half the protein and make one of the meals at a later date and then other times I make both at once and eat one for dinner and make the other for lunch for the week. 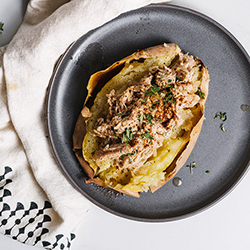 Next week we’ll step into the tex-mex realm using the second half to make Carnitas Fajita Bowls, but this week we are keeping it super simple with Pork Stuffed Potatoes but don’t think that this means it’s simple in flavor. 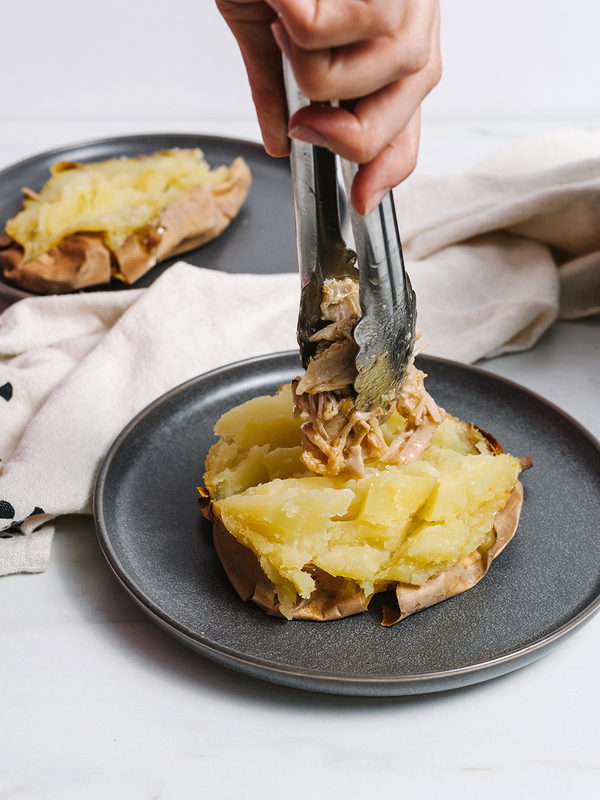 The combination of the savory pork with the almost butter japanese sweet potato is a match made in flavor heaven! Okay, so let’s first talk potatoes. This recipe can absolutely be used with a sweet potato, a russet potato BUT let me introduce you to the Japanese Sweet Potato (if you haven’t already indulged in this delight). This has recently become a favorite in our household. My personal description would be a cross between a sweet potato and regular potato. I know, I know it sounds kind of strange but oh man. It’s like the perfect delicious middle ground. They have a brown or red skin and whitish flesh that turns yellow upon cooking. 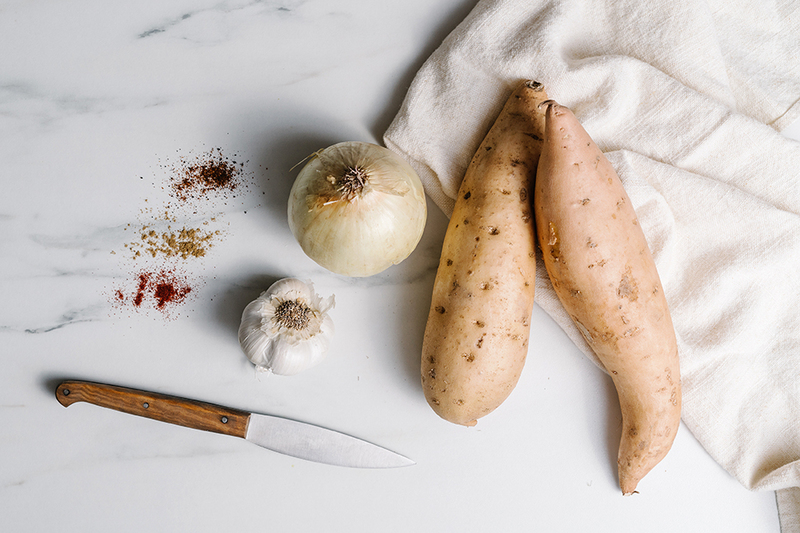 The Japanese sweet potato has a buttery, almost squash-like flavor that is divine and the texture is a little bit closer to a russet potato. Not only are these unique and so yummy, they’re chock full of nutrition. 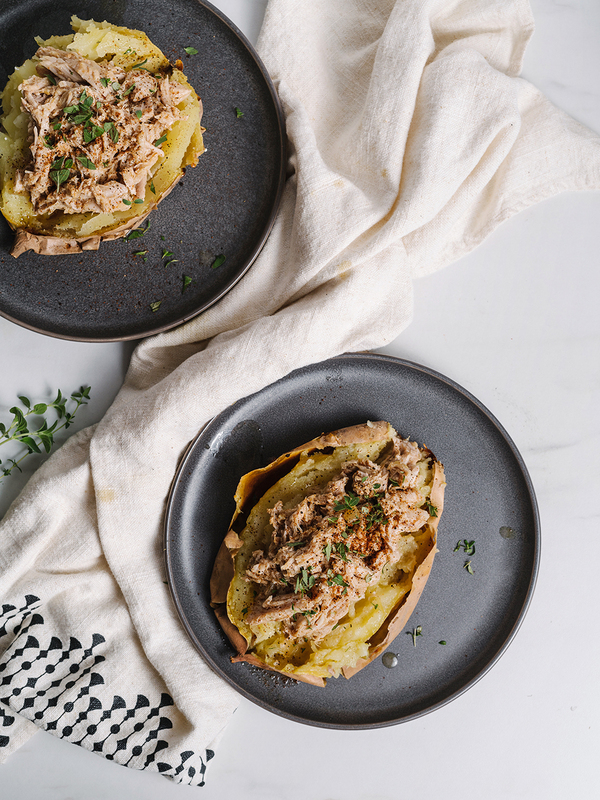 Topped with this super easy shredded pork and paired with your favorite side, this meal may just make it on your go-to list of favorite recipes. 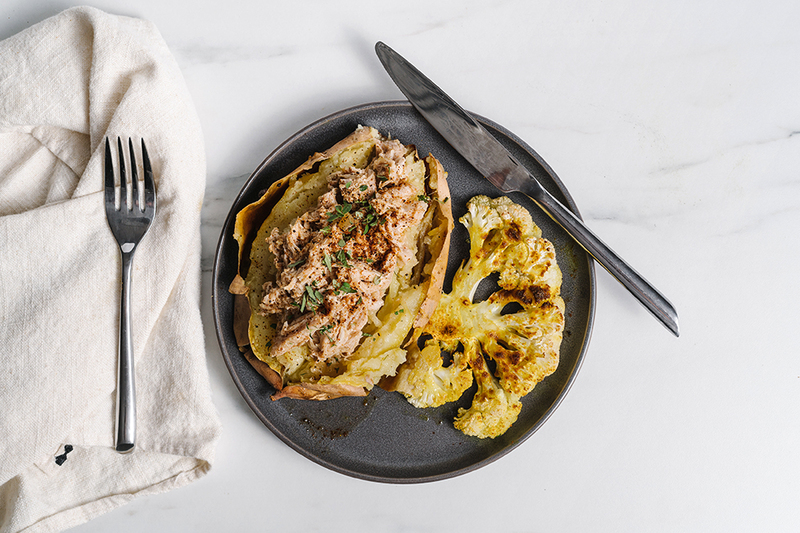 What I really love about this recipe is that I can quickly throw it together in the morning and then by dinner time, I have not one yummy meal ready but I’m prepped for two! Plus there’s lots of room for making it your own. You can also add some chickpeas, roasted broccoli, or top with avocado to add something extra to your pork. 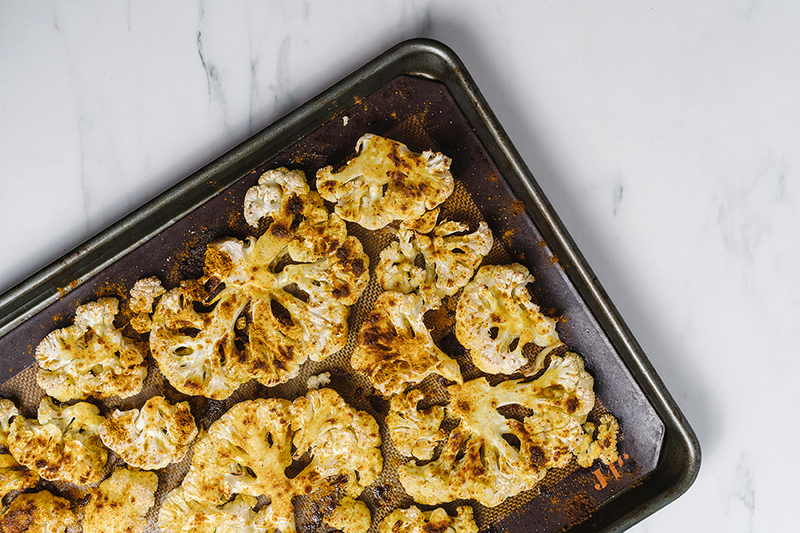 I like to keep it simple with some fresh oregano, a drizzle of hot sauce and a side of my favorite roasted curried cauliflower. Drizzle the olive oil over your pork and even spread your seasonings. Sprinkle the fresh garlic and onion over the top. Place in a crockpot on low for 5-6 hours until it easily shreds apart. 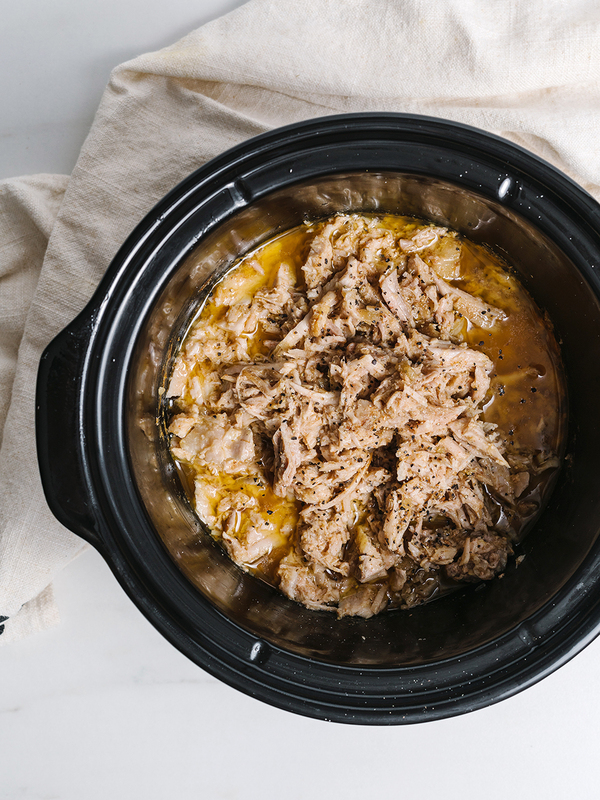 Completely shred pork and then place back in the crockpot liquid (trust me, this is the good stuff). Set oven to 400 degrees and bake the japanese potatoes for 1 hour or until a knife can easily pierce depending on the size. Take half of your pulled pork with the liquid and place in a glass airtight container and freeze or refrigerate. 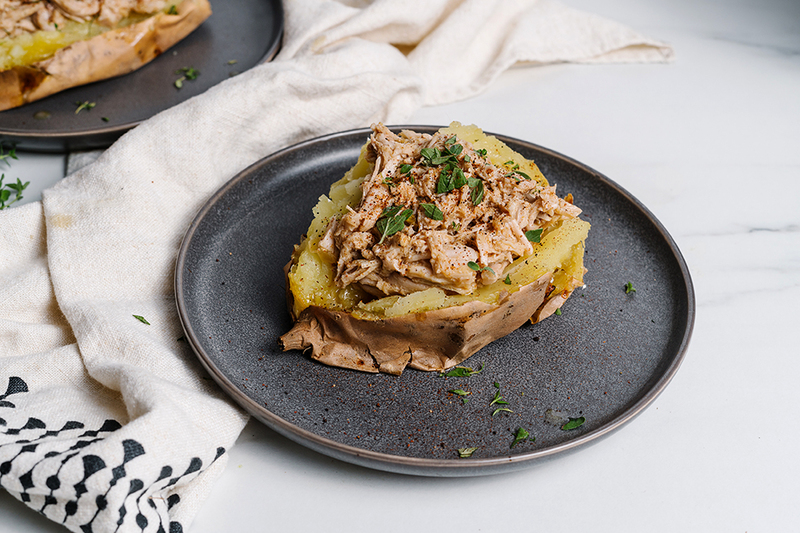 Top each potato with a mound of the shredded pork and fresh oregano. For recipe number two, Crispy Carnitas Fajita Bowls, click here. This looks so good!! I wish it wasn’t so hard to find humanely raised pork since I miss eating it! This looks delicious! And so easy too! 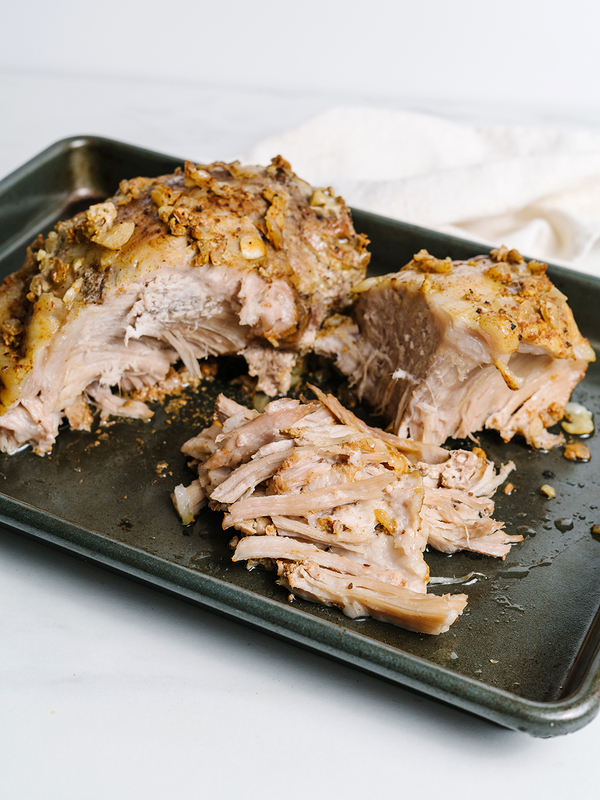 This pork looks so amazingly good – and easy! I’d love it if you shared it at our What’s for dinner party!